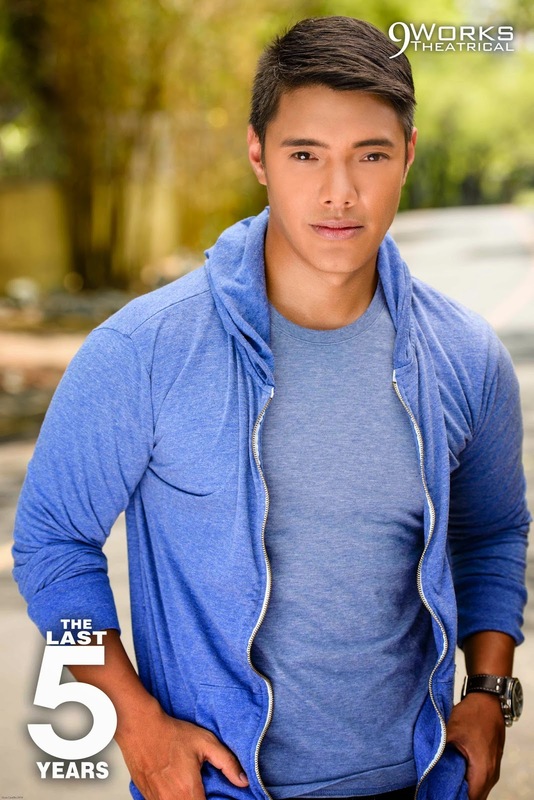 9 Works Theatrical invites you to look back, and move forward, with one of the greatest and most poignant musicals of all time, Jason Robert Brown’s The Last Five Years happening on August 9-31, 2014 at the Carlos P. Romulo Auditorium (RCBC Theater) at RCBC Building in Makati City. An intimate two-actor musical which won Jason Robert Brown Drama Desk awards and nominations for the show’s Off-Broadway premiere in 2002, The Last Five Years has been dubbed as one of the best shows of 2001 by Time Magazine, contrasting grim endings with promising new beginnings. 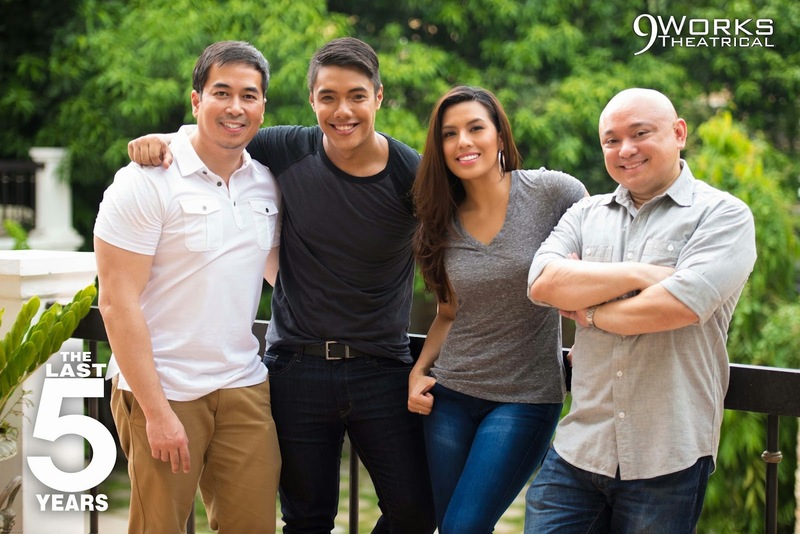 The show celebrates 9 Works Theatrical’s fifth year. The company that brought you RENT, Wedding Singer, Sweet Charity, You’re a Good Man, Charlie Brown, They’re Playing Our Song, and most recently, Grease (which bagged the 2013 Philstage Gawad Buhay award for Best Musicale of an Existing Material), returns to its theatrical roots. It launched in 2009 with the musical Songs For a New World, also by Jason Robert Brown. “9 Works Theatrical began by showcasing the brilliance of Jason Robert Brown’s music in Songs For A New World. Our last 5 years have been remarkable and as we celebrate our anniversary, it’s but fitting to mark this milestone with the staging of arguably Jason Robert Brown’s most popular musical, The Last Five Years, an apt title to match our special occasion,” says executive producer Santi Santamaria. 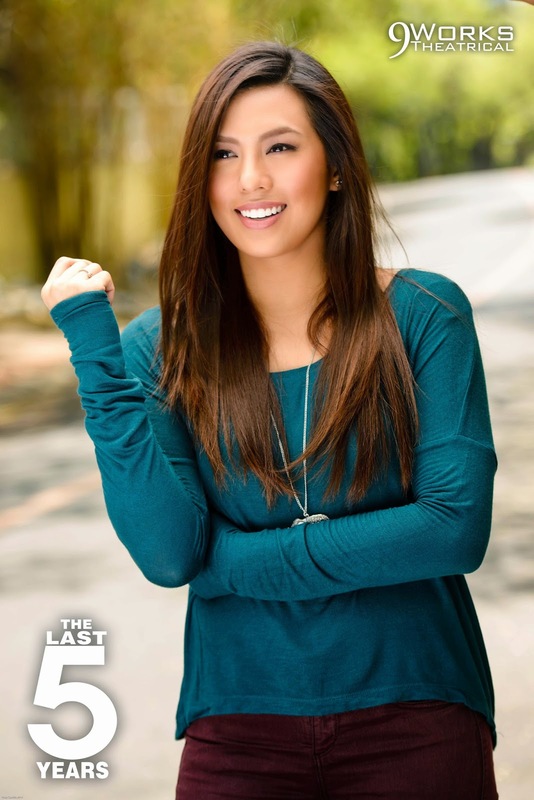 Returning to the stage after her PMPC Star Awards for TV win for Best Single Performance by an Actress and 2013 Philstage Gawad Buhay nomination for They’re Playing Our Song, singer-actress Nikki Gil will be playing the role of Cathy Hyatt, an ambitious, fresh-faced girl in a new relationship who is stunned by a betrayal that she is only beginning to understand. As with the deterioration of most relationships, there are two sides to every story. Bagging the 2013 Philstage Gawad Buhay award for Best Featured Actor in a Play for his work in Red, actor and commercial director Joaquin Valdes returns to his musical roots to play the role of novelist Jamie Wellerstein, an ambitious lad who is lovable yet makes unintentional choices that sabotage his own happiness. For the artistic team, director Robbie Guevara is joined by Joseph Tolentino as musical director for instrumentation, Lionel Guico as musical director for vocals, Mio Infante as scenographer, GA Fallarme as video & projection designer, Martin Esteva as lighting designer, Chuck Ledesma as sound designer, Gerhard Daco as technical director, Leo Castillo as photographer, Wobbletop Productions as video producer for marketing, Tin Samson as programme editor, and Larry Palma as graphic artist. 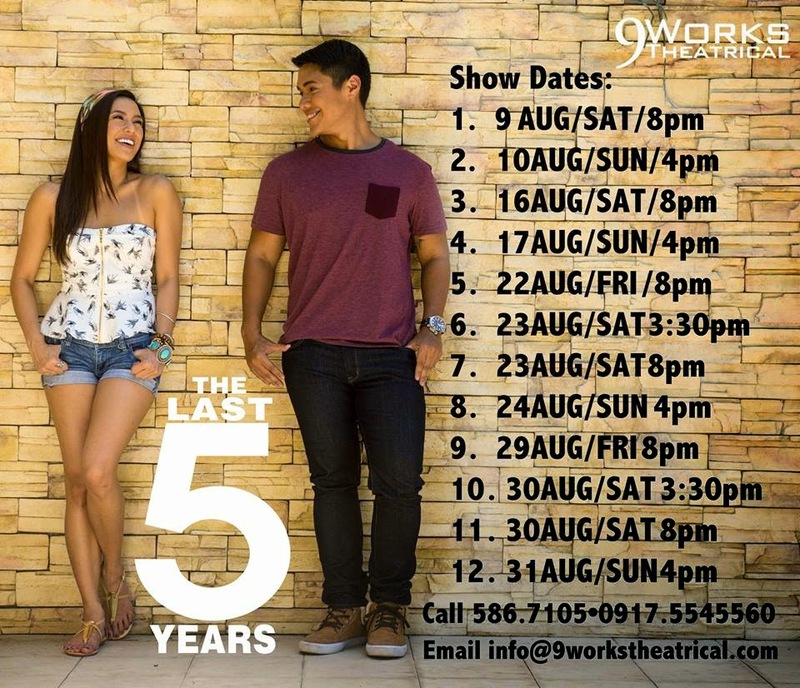 The Last Five Years will melt your hearts at the CPR Auditorium, RCBC Plaza in Makati, all weekends from August 9 to 31, 2014, Friday and Saturday galas at 8pm, Saturday matinees at 3:30pm and Sunday matinees at 4pm. The Last Five Years is presented by 9 Works Theatrical in partnership with The Rockwell Club. 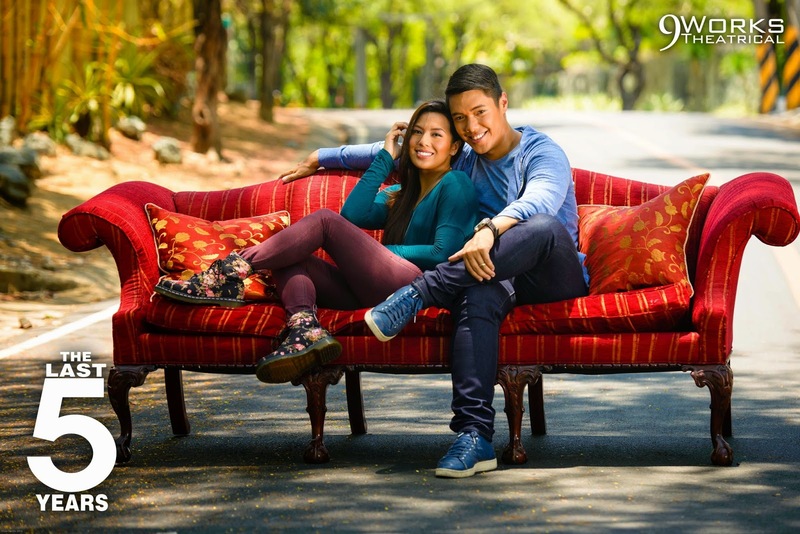 Official photos by Photoworks Academy. It is presented through special arrangement with Music Theatre International (MTI). All authorized performance materials are also supplied by MTI, 421 West 54th Street, New York, New York 10019 USA.